I have been doing “biased blow-by-blow” bike race reports on this blog for over five years now. My gimmick is that, not being a professional journalist, I don’t have to hold my tongue. If I suspect a rider is doping, I’ll say so. And I don’t couch my aspersions carefully, like “Chris Froome is a rider I’m a bit suspicious of though I hasten to point out he’s never had an adverse analytical finding that was upheld in the final analysis by the UCI.” My blow-by-blow reports are written in real-time as I watch the race ... I don’t have time for lots of qualifications or to make my case as I go. And who wants to read a lot of mealy-mouthed, timid, caveat-littered prose, anyway? If 90% of my readers think this or that rider is doping, they should have no problem with shorthand like “filthy doping scumbag.” And if they don’t like my flippant style and/or think a rider is clean whom I say is doped, they probably won’t (and shouldn’t) spend much time on my post anyway. This is all according to design. I laid out my overall biased blow-by-blow format at length in my first report and have included the “biased” caveat in every subsequent report. I have never claimed to be fair or responsible. 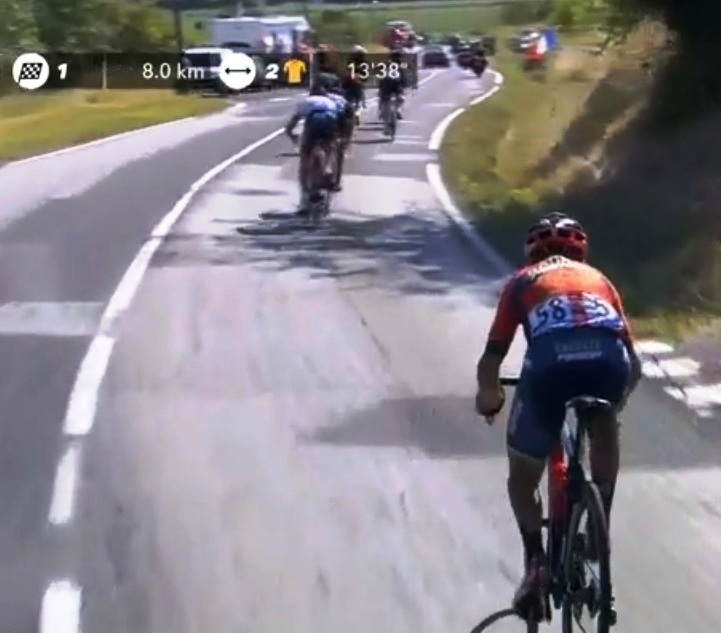 All this being said, my recent Tour de France Stage 1 blow-by-blow report seems to have really struck a nerve and offended my friend, and he cautions me against writing stuff on my blog that could adversely affect people’s opinion of me. Meanwhile, I got an email from another friend saying how strange it was reading my Stage 1 post while hanging out at his brother’s house, because his brother still thinks Chris Froome is legit. My first thought was to get these people together to form a support group—maybe they could invite Ross Perot, and after the Tour they could all set out together to find out who really killed Nicole Brown Simpson. In formal rhetoric, a one-sided argument only puts forth one’s own position, with no regard for opposing views. This can sometimes be a useful approach, such as when your audience already agrees with you and you’re trying to whip them into a lather, like at a political rally. My blow-by-blow reports are obviously one-sided. My goal with them isn’t to convince, but to entertain. The Lance era is over – why shouldn’t we trust the UCI’s decision on the salbutamol case, and base our assessment on Froome’s essentially clean slate? I will address each point in turn. And because most of the dialogue out there in chat rooms and website reader comments is pure drivel, driven by a lot of emotion and aggression and not much reason, I aim with this post do be as logical and dispassionate as possible. I hope you find that refreshing. So here I go. Before we dive in, let me be clear: of course I cannot prove that Froome is a doper. If nothing less than a giant body of irrefutable evidence is what you’re after, don’t even bother with this—go read something else. 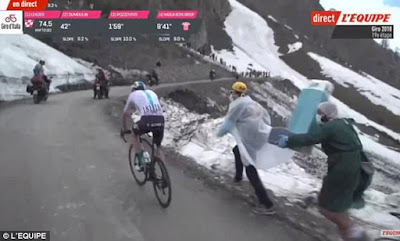 Second, Froome’s positive test for salbutamol is not the cornerstone of my case, though I will address it; as longtime readers know, I have believed Froome to be a doper all along, way before he got popped. Okay, first off, “[Fox]” above was just a joke. I know my friend meant Michael Jordan. I was just testing you … did you jump up and say, “Aha! Dana is deliberately misconstruing his friend’s argument so he can readily refute it! Classic straw man fallacy!”? Good, then … you passed! Then look at your best apparently clean time trialists: Fabian Cancellara, Tony Martin, Tom Dumoulin. Why do I say “apparently clean”? Not just because they haven’t tested positive, but because their performances are realistic. They win some TTs, they lose some, but moreover they’re almost never the best climbers in a race. The grand tour winners who have particularly excelled at time trials—Bernard Hinault, Miguel Indurain, and Greg LeMond among them—usually just held their own in the mountains (or got dropped). So it is with Dumoulin, which is why I have so far given him the benefit of the doubt. Here’s a tidbit: of the World Championships time trial winners throughout history, only three were of below-average height (i.e., less than 5’10”). All three of these were 5’9”. Two of the three, Serhiy Honchar and Santiago Botero, were subsequently caught doping. 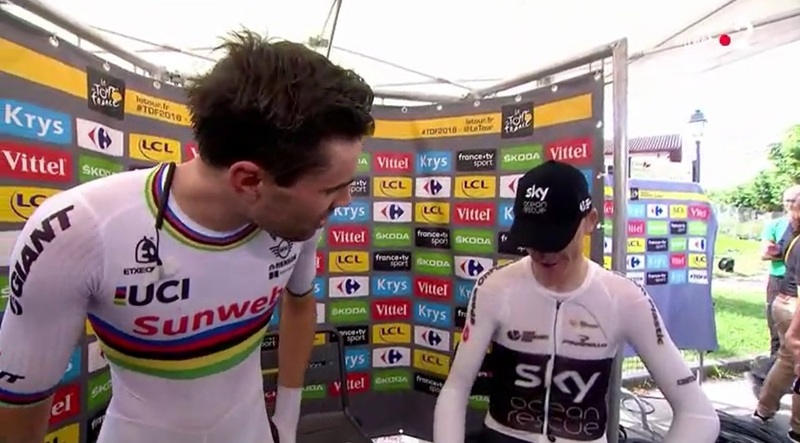 The third, Chris Boardman, was no climber—his race weight was 10 pounds higher than Froome’s, even though he’s shorter. Look here at Dumoulin: he’s got the build of a time trialist. And look at Froome: he so doesn’t. Now, both of the friends who commented on my Stage 1 blow-by-blow have brought up Peter Sagan specifically. One wrote, “You built a perfect case for Sagan being, by your criteria, a doper. Too consistent. No one can win the green jersey that many times.” The other wrote, “I still like Sagan. If he ever has an irregular test or a non-standard test or a not-quite-normal-but-we’ll-allow-it test, I’ll be super bummed.” I like Sagan too, and I like to think he’s clean. So let’s look at his case to see how a very successful rider doesn’t automatically trigger my doper-alert response. Certainly Sagan has won a lot of races. That said, he’s a great sprinter, and sprinters end up with a lot more opportunities and thus a lot more wins than stage racers, for the obvious reason that it takes three weeks to notch a single stage race victory. But Sagan has also lost a lot, when you are counting the number of races he tried to win vs. the number he actually did. (That is to say, a stage racer might target two or three races a year, whereas a sprinter targets dozens.) I can’t be bothered tabulating Sagan’s win/lose ratio, but he doesn’t completely dominate in his métier, like Froome does. Sagan has failed seven times to win Milan-San Remo. He failed to win a single stage in the 2014 and 2015 Tours. He does appear to be human. As for the green jersey, not all sprinters prioritize it over getting Tour stage wins. Once a sprinter falls sufficiently far behind in points, he’s probably going to focus on a few key stages he’s really confident he can win, and not worry so much about the green jersey. Meanwhile, a fair number of sprint specialists miss the time cuts on mountain stages and never make it to Paris. So Sagan’s string of six victories in that category is not unbelievable. It’s easy to confuse consistency with believability. Yes, a rider whose performances are totally erratic and unpredictable may arouse reasonable suspicion. But unusual dominance should not be confused with consistency. Any rider who can win a grand tour is consistent—that’s what a GC victory indicates. To get there requires massive preparation and sacrifice. For a rider to win a single grand tour in a single season—indeed, in his whole career—is a remarkable feat. But for a rider to absolutely dominate in the grand tours is incredibly difficult. Since joining Team Sky team in 2010, Froome has finished 12 grand tours. He won half of them, and finished on the podium in 11 of them. Not even Eddy Merckx had such an amazing run. Even if you gave Lance Armstrong back his victories, he wouldn’t have that astounding a track record. Froome’s achievement is all the more incredible when you consider that modern riders often build an entire season around a single grand tour, vs. the era Merckx, Hinault, and LeMond raced in, when riders were expected to get results throughout the season. And what other riders, besides Froome, have won all three grand tours consecutively? Only Merckx and Hinault. Last year Quintana tried to do the Giro/Tour double (i.e. win both in the same season), but was so tired coming into the Tour he ultimately lost 15 minutes to Froome. In 2011 Contador tried to do the Giro/Tour double and (possibly due to riding clean, though this is only conjecture) managed only 5th at that Tour. Froome hasn’t managed the Giro/Tour double yet, but last year he handily pulled off the Tour/Vuelta double which is exceedingly rare. (The last rider to do it was Hinault in 1978.) Froome’s unusual ability to recover from one grand tour in time to win the next is indeed suspicious, because recovery is exactly the challenge that EPO and blood bags help with. Again, Froome’s unprecedented consistency, in the absence of any other suspicious factors, doesn’t automatically suggest cheating … but combined with his improbable dominance in both climbing and time trialing, and his positive drug test, it doesn’t look good. Now let’s look at whom Froome has beaten in some of these grand tours: Alberto Contador, Alejandro Valverde, Andres Kloden, and Denis Menchov, all of whom are convicted dopers. Since EPO hit the scene, what ostensibly clean rider (by which I mean a rider who hasn’t tested positive) has won the Tour de France with any regularity? Until Froome, no clean rider since Miguel Indurain (23 years ago) won more than a single Tour. This isn’t because Froome’s competitors are weak, and this isn’t “erratic” performance on their part. In the modern era, to win even one grand tour requires perfect preparation, great health, a solid team, and some luck. I can believe in Cadel Evans’s Tour win because he was so good for so long, and had so many near misses until finally all the planets lined up and he managed to win. Froome, on the other hand, won last year’s Vuelta despite (by his account) suffering major asthma problems. And he won this year’s Giro with a crazy 80-kilometer solo breakaway that erased over two weeks of relatively poor riding that hadn’t even put him on the virtual podium. So he can be erratic, too. How would the positive test for salbutamol suggest a wider doping program anyway? Dana, don't forget the donkey to thoroughbred evidence. Until Thomas won this Tour, no rider had a less auspicious Tour debut than Froome. And it might be suspicious that he went from being a non-factor to an elite rider in the final year of his contract. John, that's a great point and I had many similar thoughts while watching this Tour. I've had to narrow the scope of this polemic because to get into the matter of Team Sky in general would grow the post way beyond two installments. I'm sure you noticed Sky took 2nd, 3rd, and 4th in the final Tour time trial ... pretty suspicious for a team that ought to have been pretty fried from defending the yellow jersey for so long!